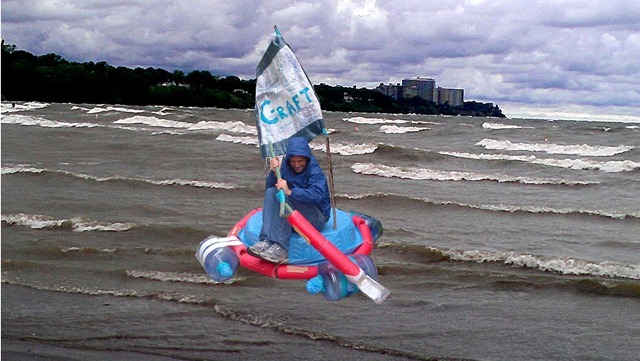 We all know the story of the Little Engine that Could, despite his unfounded fears that he was an inadequate fella’, but this weekend, our little raft for the Lake Erie Boat Float really couldn’t. 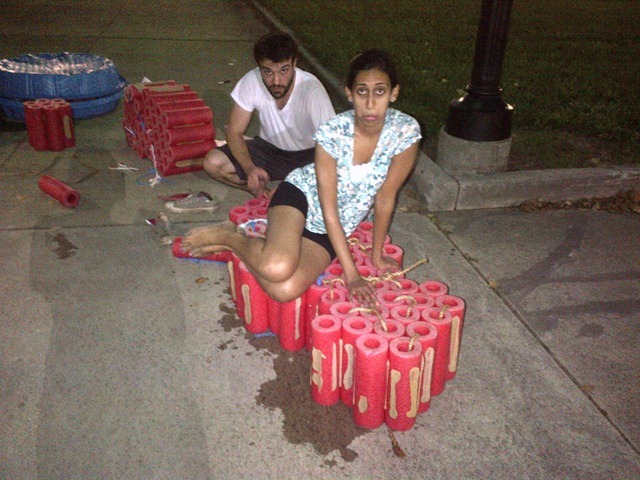 Not that it was the heap of recyclables’ fault (because we tested it and it really did remain buoyant!). 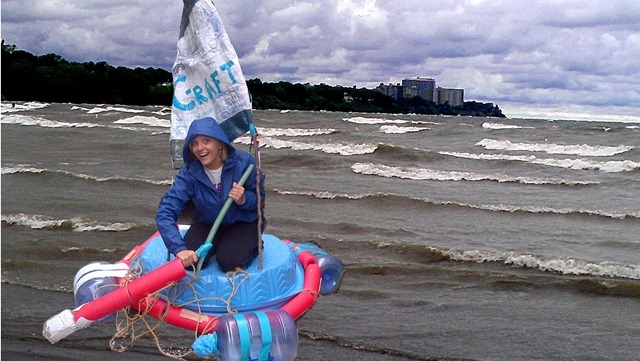 No, it was Hurricane Isaac’s remnants that damned our mission to set sail a pile of pool noodles, five gallon water jugs, old kiddie pools and mounds of plastic grocery bags – ironed into a sail and braided into rope – into Lake Erie (pictured above). 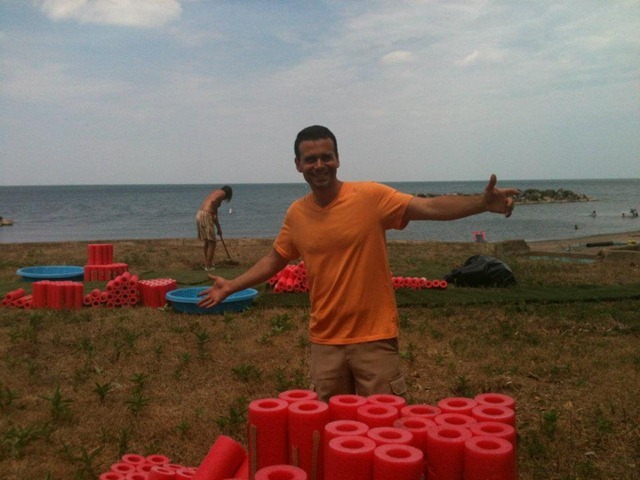 The three year old event designed to help raise awareness about the impact of plastic on our environment held a permit to launch rafts made of entirely post-consumer recyclable material at 10am on Saturday. Unfortunately, raging winds and rains moved into the area overnight at by sunrise, Edgewater Beach was being pounded by waves I thought were only possible in the ocean! Over the course of the past two weeks, Craft+Wine Club’s regularly scheduled programming had been transformed to include boat building, including two off-site events at Euclid Beach where we tested the rafts (take one and take two, at right), fully confident our little guy would safely take Nidhi out to Canada and back again. We christened the boat, shown below, something Bridget said she had always wanted to do. Meanwhile, Nick signed his name, Nidhi said “what are you doing?” (I presume, because she asks this of Nick a lot) and Stephen said “you know, I just checked the radar for the tenth time in twenty minutes and there are going to be 8 foot waves”. Nidhi was significantly less confident at 8:30am on Saturday, and so while she was overjoyed that she would not become part of the many sunken ships and perished crew lurking in the bottom of the Great Lakes (like she also would have been if she had ridden the noodle cluster pictured at left and below! ), Stephen was inversely irritated to learn that this lovely contraption would remain in his van (at the event, PolyFlow would have been available for us to re-recycle our creation!). However, having a liking for organization, the float didn’t last in the back of the van long; but before Stephen banished it to its current resting place on a hook in the garage, we had to put the good fella’ to use and simulate the act of rowing. In the driveway. In raincoats. You didn’t think these were Photoshopped, right?! 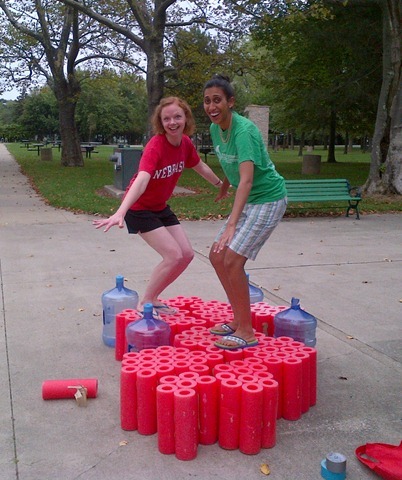 Thanks to everyone on team CrAFT: Nidhi, Bridget, Tiffany, Julie, Juliana, Laei, Nick, Stephen, Ricky and Ariel! We’ll get ‘em next year! Today, north winds brought waves crashing over the rocks that line Euclid Beach in North Collinwood, and despite the noise, created an atmosphere of serenity. 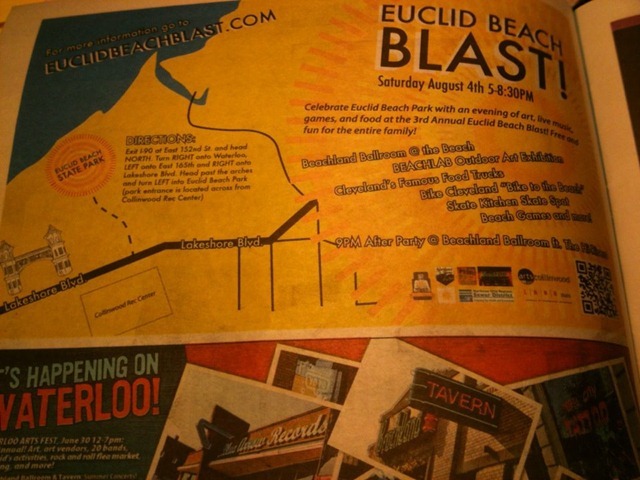 Yesterday, southern winds ushered in hundreds of people from all over greater Cleveland to join a rocking party on the beach, aptly titled Euclid Beach Blast. Both scenarios demonstrate why the shore point, former home to the Euclid Beach Amusement park, is a great destination in North East Ohio. 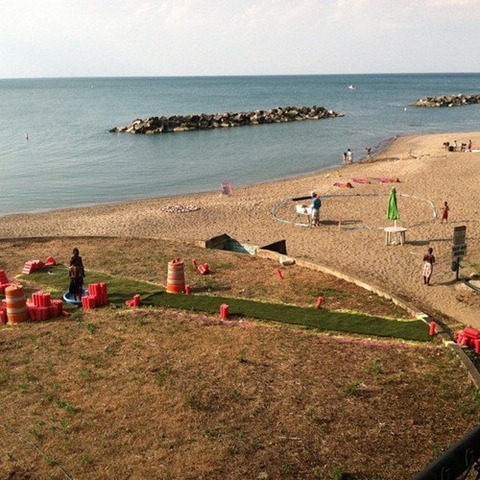 And with the combined efforts of the Sewer District, the local CDC and groups like Alliance for the Great Lakes in support of the newly launched Urban Beach Ambassador’s program, the water quality of Lake Erie is on its way to healthy levels, even after a rainfall event. The second annual Beach Blast truly was a blast, combining the creativity of neighboring artists with locals’ passion for one of the region’s best resource. The Blast is Stephen’s creation, a way for him to express his love for and belief in the greatness of the north coast shore in a way that people of all ages can enjoy. BeachLab, an interactive aspect of the Blast and brainchild of Collinwood artist Ivana and CIA employee Ivy, demonstrated to Blast goers the varied potential of the park’s vast property while a masterplanning proposal from MKSK (out of Columbus) and Land Studio (in Ohio City) generated conversation about linking Wildwood, Villa Angela and the Recreation Center to the beach. My recycled paper roses, manufactured for sale at this summer’s Collective Upcycle pop-up, made a return appearance in the “Recycled Rose Garden”, suggesting that plantings could spruce up patches of under-utilized lawn (above). As a volunteer, I was awarded a t-shirt, a food truck voucher (which I redeemed for a Po Boy at B&M BBQ) and a voucher for a free burrito to Chili Peppers on E.185th (which we redeemed today, and the burrito was sensational. FYI: all Beach Clean-Up attendees at Euclid will be given a burrito voucher in the future, and this fact alone should be motivation enough!). 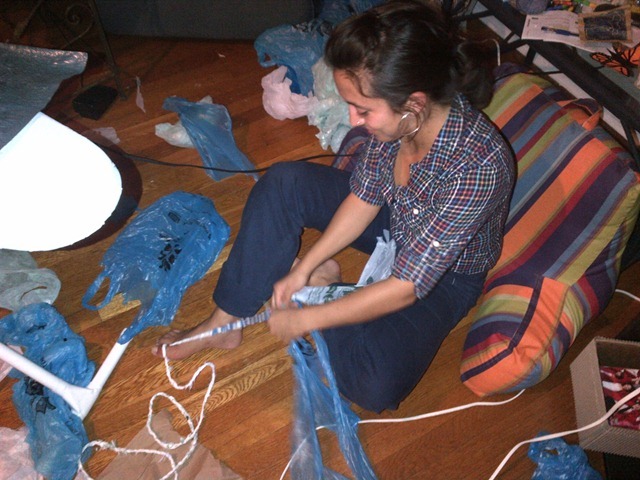 In addition to installing my artwork and assisting in the creation of the children’s playground on the plinth of a former amusement park ride, I spent the evening crafting trash mobiles with Nicole of Plenty Underfoot. A crew of us made samples at Nicole’s studio last week and tirelessly scrubbed recyclable trash for beach goers to string onto mobiles of their own. 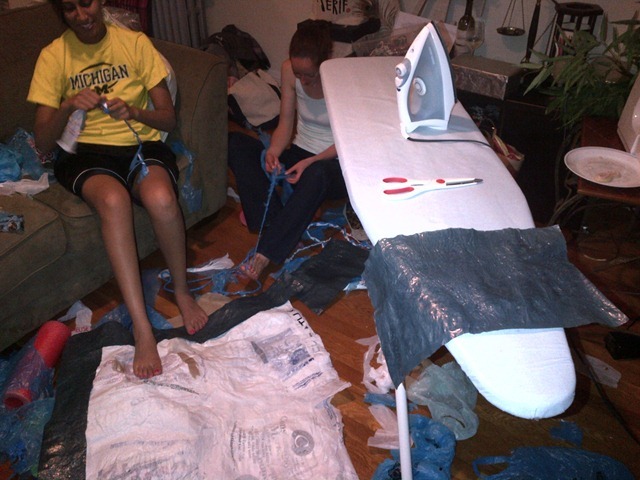 You can read about our craft night on the Detroit Shoreway, here! 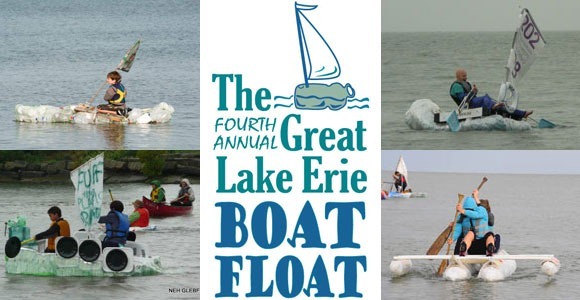 My mobile is pictured above and is resplendent with bottle caps, plastic toy pieces and a tampon applicator – all found by clean-up crews on the shores of Lake Erie! GROSS! GROSS! GROSS! 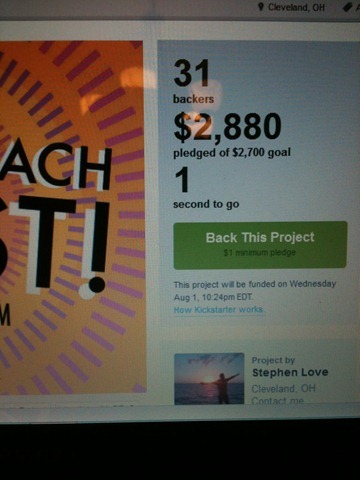 Funded by the generous support of backers on Kickstarter, in addition to raising awareness, the Blast provided a safe, fun atmosphere for people of all ages to dance, craft and dine at Cleveland’s Famous Food Trucks! Other activities included games, face painting and of course, music! 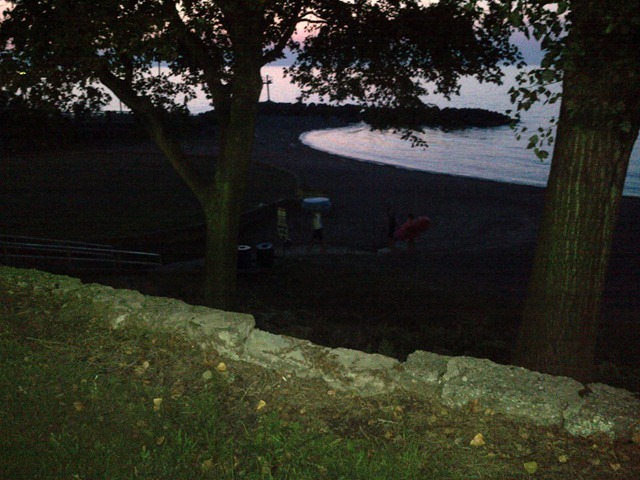 In addition to the after-party at the nearby Beachland Ballroom, three bands performed with Lake Erie in the background including The Hesitations singing covers from the ‘50s and ‘60s and Son Gitano, Stephen’s band, performing original Latin fusion jams. Sad you missed it? I bet you are! 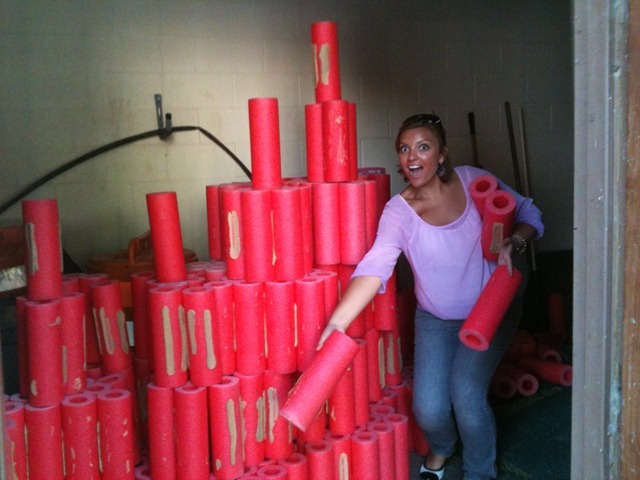 Well, never fear, the Euclid Beach Adopt-A-Beach team is always looking for volunteers and clean-up events happen through the Fall with Ivana leading the occasional free yoga class as a cool down to lugging around pounds of recyclable trash! 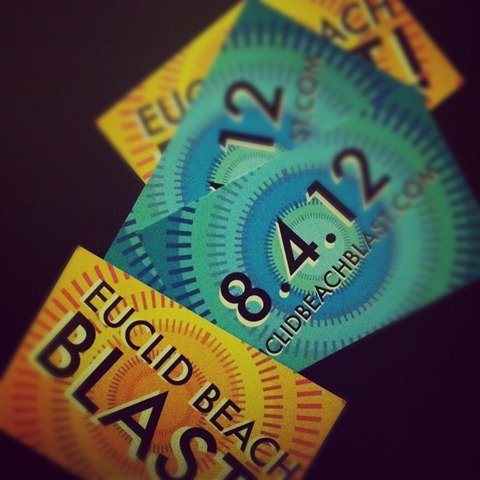 Planning for the Blast 2013 will likely start soon, so stay tuned to the FB page for details! 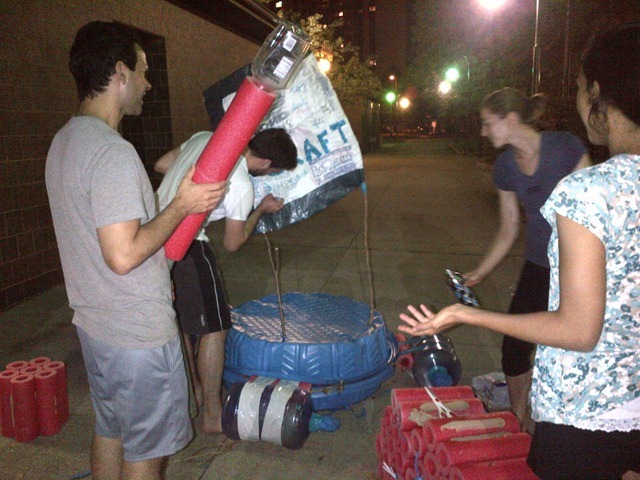 Also, the next Urban Beach Ambassador’s training will be held at Edgewater this Thursday at 6:30pm-8:30pm.